http://www.tonkori.com. He returned to Japan in 1992, and was presented with his first tonkori – the traditional stringed instrument of the Karafuto Ainu. Originating from the Sakhalin Island, the instrument inspired him to relocate to Hokkaido, where he taught himself to play and craft the tonkori. Currently, OKI is the most prominent performer of this instrument in the world. His contemporary approach, which fuses Reggae, African and Electronica with Ainu folk melodies, has won praise not only in Japan, but also worldwide. Through his active participation in the United Nations’ Working Group on Indigenous Populations (WGIP), OKI has developed a network with other indigenous artists. He has collaborated so far with the well-known Native American Flutist, R. Carlos Nakai, the Australian Aboriginal band, Waak Waak Jungi, the Taiwanese singer-songwriter, Pau-Dull (Chien-Nien), as well as Abe Barreto Soares, the East Timorese poet, and the Siberian vocalist, Olga Letykai Csonka. Many of these collaborations are featured on his latest album, No-One’s Land, released in 2002. OKI is accredited as the producer for the widely acclaimed CDs Ihunke (2001) and Upopo Sanke (2003), both featuring Umeko Ando, the renowned Ainu performer of the mukkuri (Jew’s harp) and upopo (traditional chanting). 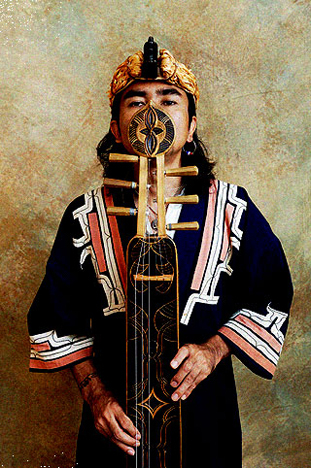 In 2004, OKI toured throughout the US, as well as performing at WOMAD in Australia, with his band OKI & the Far East Band. In 2005 OKI Dub Ainu Band were one of the sensations of the WOMAD festival in the UK, where they also appeared with the highly regarded British broadcaster Charlie Gillett live on BBC London. In 2006 OKi Dub Ainu Band were the closing act at the City of London Festival and the group toured in Norway and Spain. Oki recorded with Irish group Kila on the album Oki and Kila, receiving rave reviews by fRoots (playlist) and Songlines (Top of the World). Tracks from Oki’s Dub Ainu CD have been selected for Charlie Gillett’s Sound of the World compilation 2006 (Rhino/Warner Bros.) and the Very Best of World Music (Nascente).